By 1917 at the King Bee company, Babe worked along side Charlie Chaplin imitator Billy West. Ollie frequently played a heavy resembling Chaplin’s foil Eric Campbell. King Bee set up shop in New Jersey, then moved to Hollywood, California. I luckily obtained a copy of “The Chief Cook” from 1917. 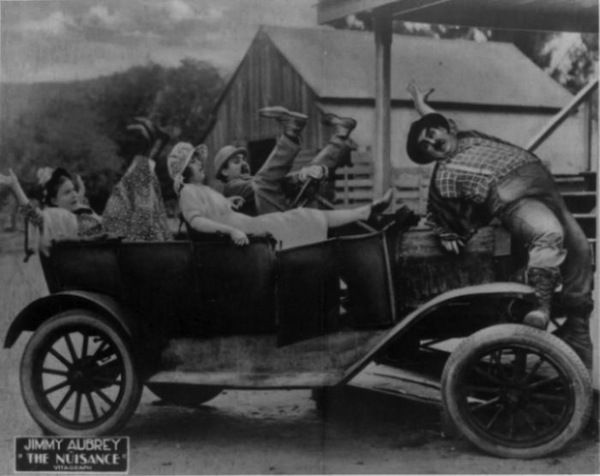 It was a fairly typical Billy West comedy co-starring Oliver Hardy as head of a traveling theater company. West, as Charlie Chaplin, caused problems and panic for Hardy at a hotel. I thought there were some good slapstick sequences and it was fun to see how well West imitated Chaplin. There was an interesting scene at the train station when Hardy and his wife arrived. Real travelers could be seen in the background which gave me a small peek at the lifestyles and social behaviors in 1917. The story wasn’t very funny, but I laughed at the crude attempts at special effects. That was certianly acceptable, though, considering this film’s age. After appearing in a number of Billy West films, Babe worked at L-KO studios. There he acted in shorts directed by Charles Parrott, who later became a successful comic star on his own as Charlie Chase. Then, from 1919-21, Ollie made a bunch of shorts for Vitagraph pictures. Many were with somewhat forgotten figures such as Jimmy Aubrey and Larry Semon. Between this period, he was involved in a one-time film production with G.M. ‘Broncho Billy’ Anderson’s Amalgamated Producing Company. It was designed to spark off the career of a struggling actor named Stan Laurel. The film was “Lucky Dog”, and it would mark Oliver’s first appearance with his future on-screen pal. A source of much debate among us film buffs, it was thought this film was done in 1917. Now it’s confirmed that January or February of 1921 was the likely date, since it was passed by the censorship board of New York in October of that year. In November 1921, Babe divorced Madelyn and married Myrtle Reeves. But Laurel and Hardy’s first appearance together didn’t kick off a steady stream of team pictures. In fact, “Lucky Dog” did little for Stan’s film career, so he went back to vaudeville. Later, Stan re-entered the film world with Anderson to make a series of pictures. Then he joined Hal Roach studios where, by chance, he’d meet Babe again.